As you know, I like to keep things real. I like eating real food and I enjoy my real life which is full of family, friends, and activity. Like many of you, my family keeps me busy with lots of sports and activities in the evening and on weekends. My full-time job keeps me busy during the week. There are just not enough hours in the day to do everything. My house suffers. Sure, we keep the kitchen clean, the bathroom gets scrubbed, and we put things away on a daily basis, but the clutter slowly creeps in and gets out of control. The house didn’t get cluttered in a day, so there is no way that I am going to unclutter it in a day. I have a bit (a bit, that’s funny) of a perfectionist personality. I really would prefer to take a week off of work, pull everything out of my house, and only put those things that I really need back into the house. Since, there is no way in heck that is going to happen, I’ve decided to take a different approach to decluttering. My goal each day is to get rid of 10 items per day until the clutter is gone. I am going to focus on one room at a time so that the change is noticeable to me. I think this will help me to stay motivated. Now, is a good time for me to start this project. I have one son who has graduated from college and moving into his own grown-up home. I have another son who is just starting college. Another school year is about to start for my little ones. Lots of changes. These changes are really getting me motivated to make some changes. I invite you to join me this week. Join me in the declutter challenge for busy folks. I’m starting in the master bedroom. The place that everyone likes to dump their stuff and the place that clutter often goes to hide. It should be our sanctuary from the craziness and stress of the world. We want our sanctuary back! Find 10 things each day this week and either relocate it to its proper place, toss it, or donate it, or sell it. Keep it simple. We have all day to reach our 10 item goal. 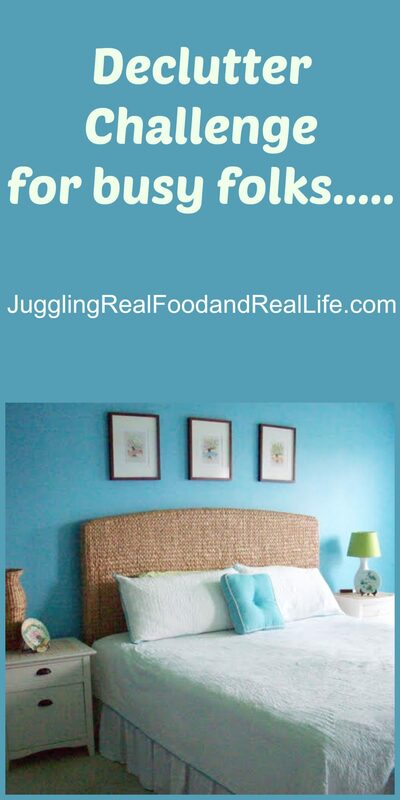 As I look around my room, I noticed the following items that are major sources of clutter in the master bedroom. Accessories you no longer use like scarves, purses, etc. Are you joining me on my declutter challange? What room do you find to be most problematic. What clutter drives you the most crazy? Gaye @CalmHealthySexy recently posted…4 Ways to Stop Beating Yourself Up! Ahh……..you figured out my secret! LOL! It’s nice to know that I’m not alone. The struggle is real. A de cluttered house? Sigh. I’m game for 10 things a day. Sticking to one room at a time is a great idea. The visual in the end would be motivating to keep going. Let’s do it! I’m trying. This is not going to be easy for me. Let’s support each other and make this happen! Great list, now only to stick to it…LOL. Thanks for sharing your post with Thursday Favorite Things! I’m trying to stick to it. It’s not easy for me…….that is for sure. My most crazy room is the mudroom AKA dumproom! Following your daily challenges and thanks for the help!